Let’s face it. I’m a sucker for romance. Not the Victorian frilled heart sort of romance we see from greeting cards and Valentines. Not puppy dog posters or anything that comes from a suggestion list or out of a box. I like romance that seems organic and feels real. And I found it in Eureka Springs this past weekend. Don’t get me wrong, I appreciate efforts. But for our 10th wedding anniversary, my husband and I needed an escape worthy of celebrating a decade of love (or at least mutual tolerance). We found it… at a new place, The Grand Treehouse Resort. Six brand new treehouses out west of downtown on Highway 62, tucked back along a ridge off the north side of the road, somehow quiet despite traffic not far away. They blend into their surroundings with a quiet calm that befits a proper retreat. 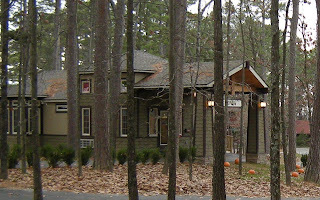 We landed there on a Thursday afternoon in November, ready to stretch our legs after the drive up from Little Rock. Check-in was quick and easy, and we were guided to our own private driveway by our cabin, Big Pine. The sinking sun was stretching out those last rays of daylight as we approached. 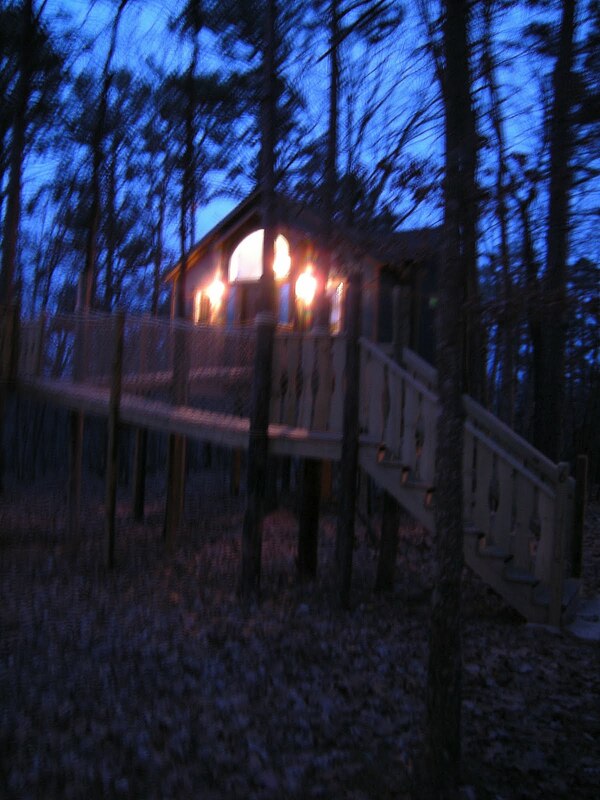 My husband gleefully climbed the stairs and clambered across the wood and rope bridges up to the front door. We stepped through the gigantic rustic doorway and into the single large room, quickly overcome by the elegant simplicity of it all. 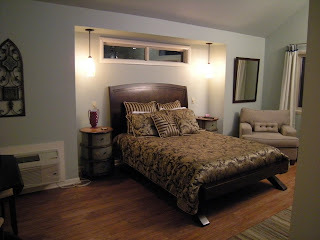 A large dark bed decadently clothed in a lush duvet and pillows crouched in an alcove along the eastern wall, flanked by matching oval bedtables and pendant lights, their dimmer switches close at hand. An easy chair to our right invited us to set down our belongings and settle within its ample space. Overhead, the ceiling arched to a peak above the center of the room. A small drop leaf table and two chairs looked like a good place to plunk down our few technological connections to the outside world for a charging. The other side of the cabin offered even better amenities. 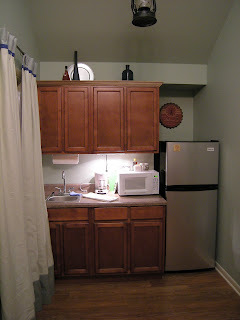 The kitchenette’s small but ample fridge was a surprise -- finally, a place where you can fit more than a single ice cube tray! A microwave and coffee maker graced the counter; I noticed the packets of green and Earl Grey teas and the carefully labeled jars of sugar and creamer immediately, and the honeybear, too. The one separate area in the whole treehouse is the closet where the toilet is housed, deceptively large thanks to a “bumpout” in the cottage, with its own window and hooks to hang belongings. A two person shower and marble-topped vanity faced off elegantly across the bathroom area hall. Beyond, my biggest thrill, a two-person jetted tub set into a window. Roman blinds perched above the alcove. 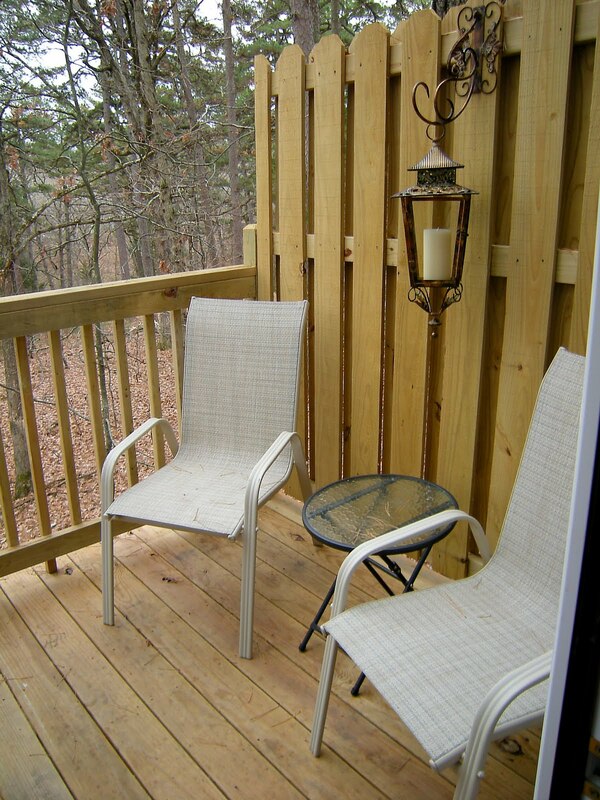 And out back, a small deck with two chairs, with a candle lantern hanging above. I noticed that there was an outdoor electrical light as well. 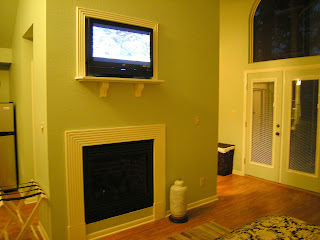 Turning back to the middle of the room, I noticed the gas fireplace, operated by a single switch on the wall. Of course I had to turn it on. Above it, a 32” flat screen TV clung to the wall, sharing a DVD of a fish tank in action. Ah, what a sanctuary. It didn’t take us long to discover treats left for us in the fridge -- fresh orange juice and two slices of homemade cheesecake, one with layers of deepening chocolate, the other raspberry and cream on a dark chocolate crust. These we saved for the morning, enjoying our orange juice with champagne for breakfast mimosas. 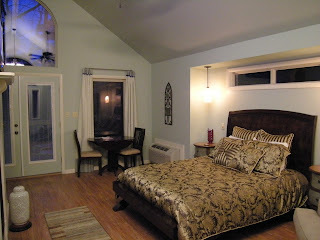 We settled in a bit before heading out for dinner at Café Amore down the highway. 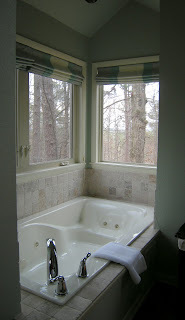 On returning I was able to enjoy the splendor of the bath. I quickly noticed a few things. One, the available candle for light at the end of the tub. Two, the way the treehouse was angled, I had the privacy I wanted without having to drop the Roman shades. 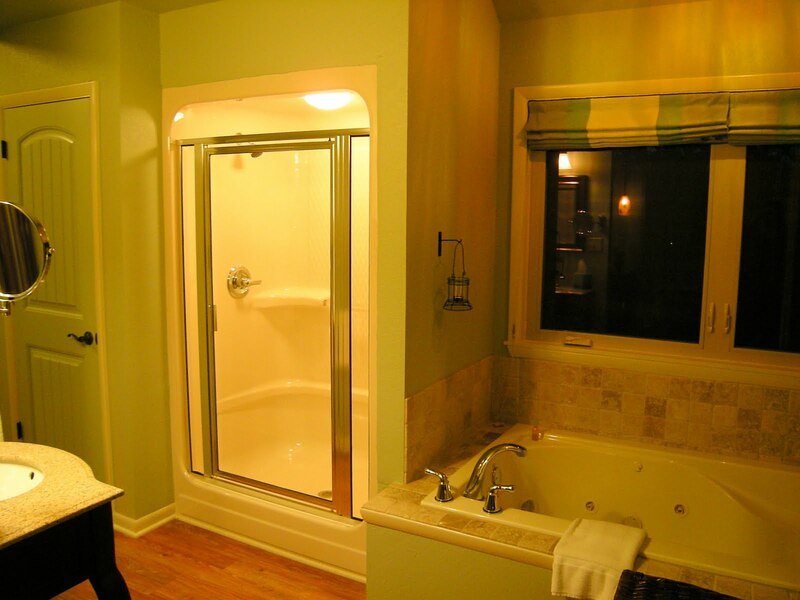 And three, the windows each have crank windows that swing out the glass and leave just a screen between the bather and the outside world. Even on a cool night as this, the breeze was welcome, and I listened to the season’s last crickets as they chirped their autumn tunes. 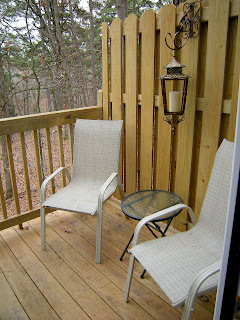 My husband’s the one who realized that the deck was also very secluded and private. One side of the structure is a privacy fence; a second is the alcove from the bath; the third, a railing for this balcony that encompasses nothing but forest in its view. 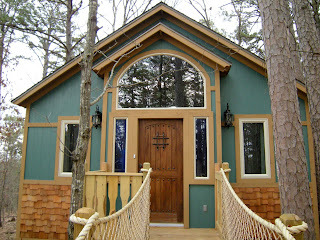 We both agreed, we loved the door to the tree- house. The big solid oaken door is like that you might find on a tavern or speak- easy. 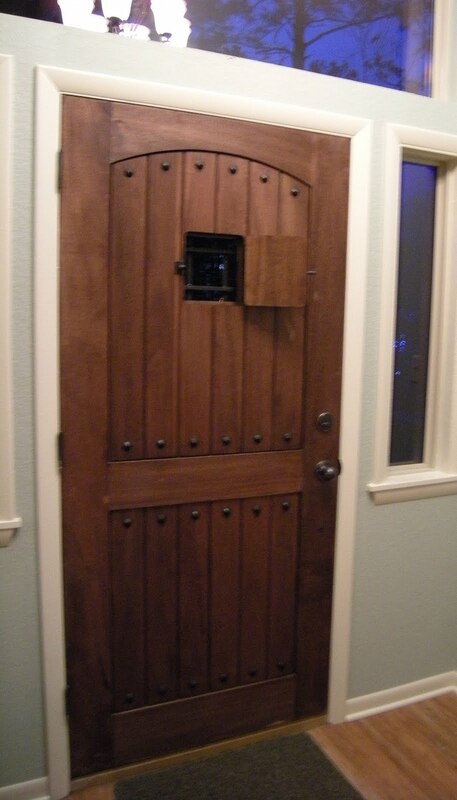 Instead of a peephole there’s a full six-inch square miniature door at eye level. It gave us ideas for our own home. Blue stained glass filled the slender windows on either side. Daybreak came at 6:30am, when rose-colored light from the sunrise flooded across the floorboards. 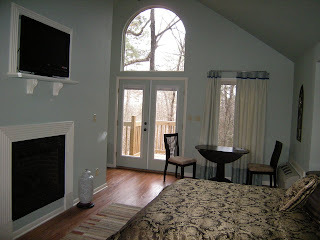 We hadn’t considered this when we had retired for the night, and I found myself sleepily acknowledging the beauty of the moment as I padded across the floor, flipped the in-door blinds on the French doors to the deck and pulled close the heavy drapes on the window right by. I tumbled back into bed and we snoozed until the light streamed in through the stained glass in the long narrow window over the bed, spreading stripes of blue and green on the fireplace wall. Showering was a pleasure, with about as much hot water as we could handle. 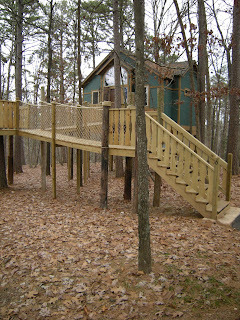 I suspected that, considering the layout of the treehouse, that hot water must be supplied by an inline on demand heater. Indeed, throughout our visit we never ran out of steamy water. 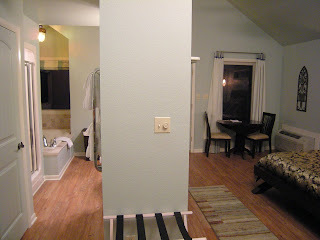 Better still was stepping out and enjoying a warm towel straight off the heated towel rack. A special treat. We lingered at the treehouse far longer than we had allotted in our itinerary. I wondered if perhaps that was because we were so comfortable. Or maybe it was because there was no pesky housekeeper demanding the opportunity to perform their duties on a schedule. In fact, we were left to our own devices for most of our stay. We dropped back by before dinner, and our kind host came over and offered us more tea for our stay, having noted that we’d already broken into the provided stash. Then off to dinner at The Grand Tavern to celebrate our anniversary. We returned late in the evening and spent time on the deck, noting the quiet and the lovely breezes that passed. Once we were ready for turning in, the gas fireplace warmed our toes. Indeed, we were not ready to leave the next morning, and if we’d had more time we would have happily spent another night. We spoke with Frank Green, our kind and thoughtful host, for a while before leaving Eureka Springs. 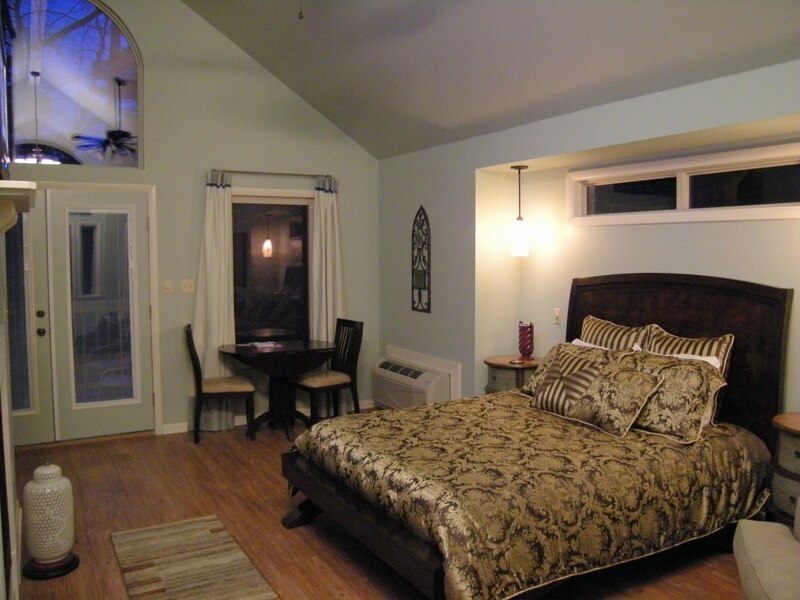 We were surprised to find that the property had only been operational three months. 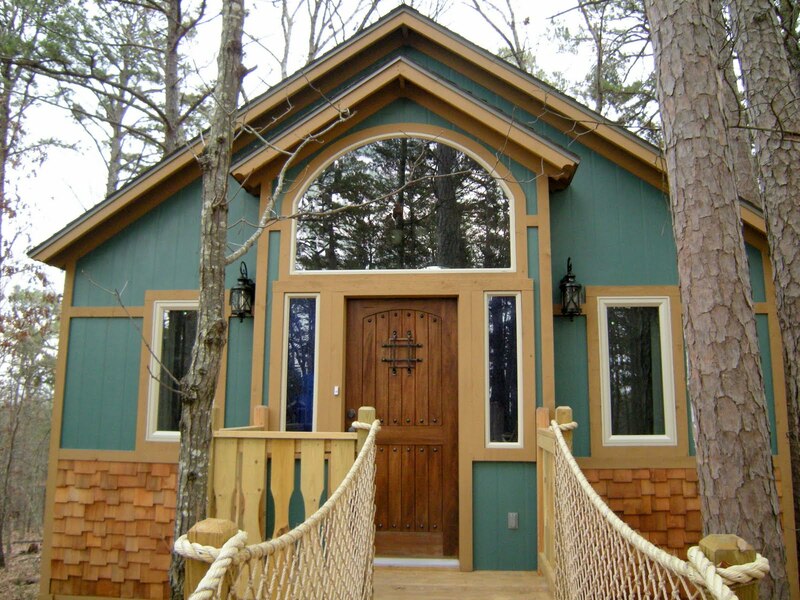 Each one of the treehouses was a little different -- but all included the tubs, the pillow top beds, the private decks and the seclusion of a relaxing retreat. 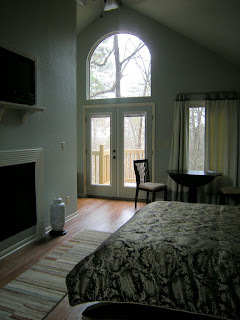 The stained glass and gorgeous views were another pleasant touch. As we headed for home, both of us agreed that we’d love to spend another weekend or two at The Grand Treehouse Resort, and perhaps this would be a good place to celebrate our anniversaries. 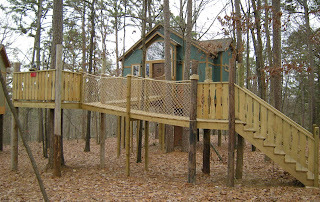 These two-person maximum, no children allowed treehouses are quiet and beautiful, and just might be the perfect place to escape from the world. So I’m actually working against myself here telling you about them. After all, once word gets out how special this place is, we might have a hard time reserving a treehouse for our special rendezvous. But, dear reader, that’s what I do, tell people about where I go and what I do. Each one rents for $149-$165, depending on the time of the year and the time of the week and all of that. They’re all $165 during October, prime fall foliage season. 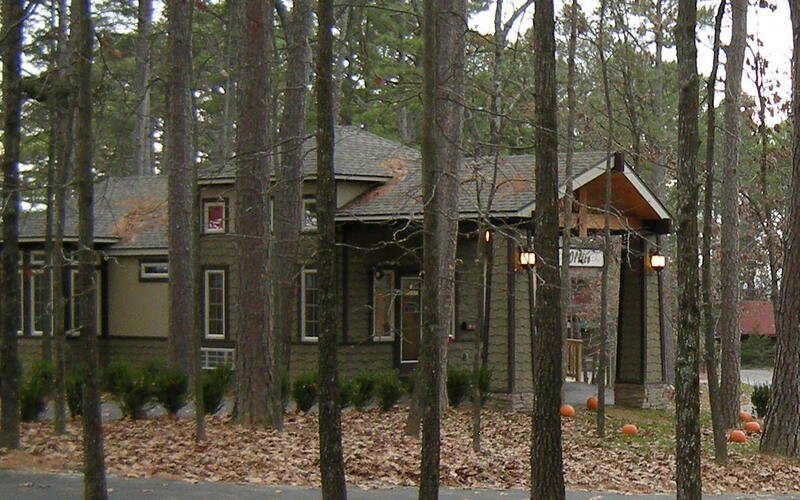 If you’re interested in learning more, check out The Grand Treehouse Resort website or call (479) 253-TREE.